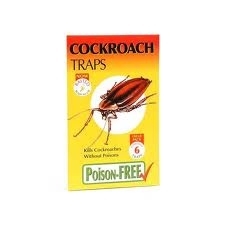 Pack of 6 Cockroach Traps which are sticky glue board traps for catching and trapping cockroaches. For best effect, place these Cockroach Traps in areas where you have seen cockroach activity. In kitchens you can put them behind kitchen plynths or behind fridges to stop and catch roaches being able to come out at night and walk over worksurfaces.